Senior Pakistani militant leader Mullah Nazir has been killed by a US drone strike with at least five other fighters in the north-west tribal district of South Waziristan near the Afghanistan border, security officials say. Nazir was a leader of a faction Pakistani Taliban militant group and has been accused of sending fighters across the border into Afghanistan to fight the “foreign” US troops there. 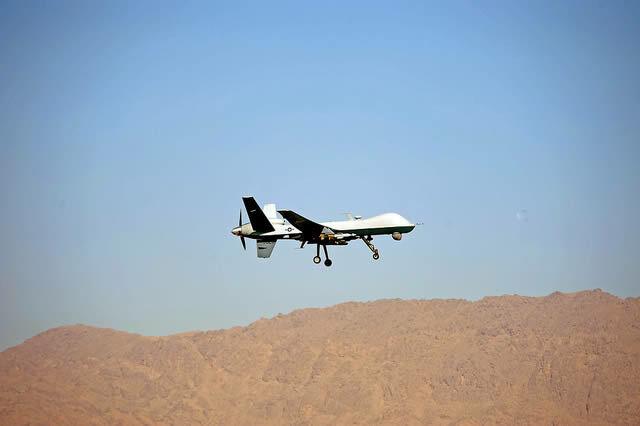 The drone struck with two missiles which hit a building which housed Nazir and some of his fighters as they attempted to change from his pick-up into a new car after it developed a fault in Angoor Adda in South Waziristan. Reports claim that Nazir’s deputy, Ratta Khan, was also killed in the strike along with a number of other “militants” whose number and identities are yet to be confirmed, with reports varying from four to eleven killed. Nazir had the tacit approval of the Pakistani military with which he signed a non-aggression pact putting him at odds with other Taliban leaders, as he favoured only attacking “foreign” military targets in Afghanistan. The rivalry between the various Taliban-linked ground was demonstrated in November 2012 when Nazir was targeted by a rival group with a suicide bomb attack on his convoy in Wana, South Waziristan’s largest town. This drone attack will be seen as a successful decapitation of a terrorist group by the US military, and will create a power vacuum within his faction. However, it will also be seen as problematic by Pakistani authorities with whom Nazir’s uneasy truce had meant that he was relied upon to keep order and peace in parts of South Waziristan. The power vacuum will not simply be within the militant Taliban group, but also across much of the South Waziristan region, with there being a possibility that another group which also targets Pakistani military personnel may rise to power increasing instability in the region. The US drone strikes used in Pakistan amongst other locations around the globe have come in for criticism from commentators both because of the collateral damage of the missile strikes which have resulted in the deaths of innocent civilians, women, and children, as well as their use outside on foreign soil outside of any declaration of war. The president personally approves or vetoes each drone strike.